Today’s featured guest is Richard Greenberg, author of Faith in a Box, a memoir of faith and renewal. It was the early 90’s and Rick Greenberg had it all, a beautiful wife, adoring children, and a great career. Rick, a marine, had seen his share of trying times. He had fought in two wars, Vietnam and Iraq and lived to tell the tale. Life was beautiful, but on a fateful weekend, during a Vietnam vet reunion, his perfect world was turned upside down. Tragedy would strike, taking from Rick his dearest and leaving Rick, himself, near death and in a coma. Doctors gave no hope to the family. However, thirty days later, Rick awoke. His doctors were stunned. His family knew it was a miracle. Rick wanted no part of it. All he knew was that his wife was gone and so was his faith. 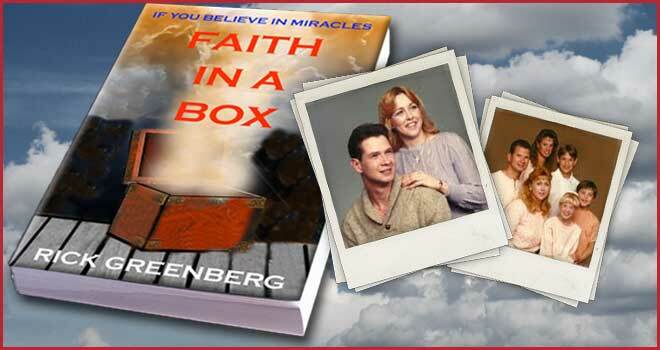 Faith in a Box chronicles Rick’s grueling recovery, his journey into the abyss and how miraculously he found his way back toward the light and a faith he thought was long lost. It’s a story of love and courage, inspirational and uplifting. I dare you to read this book and not be moved. Rick was kind enough to consent to an interview via e-mail below is our exchange. 1. Rick, your story read like a testimony (and a powerful one at that). In the book, you hold nothing back. You’re very honest about your loss, your struggles, your doubt in God, and your journey into the abyss and back. How difficult was it to put your life on display like that? This was perhaps the most difficult thing I have ever done. In the book, you read how I gave a few testimonials to my church congregation and thought I was done. It was more than twenty years later before I felt compelled, by God, to write the book. When I gave my testimonies in church, I had to confess that I was a non-believing sinner. I felt, if I’m going to do this, then I must tell it all, leave nothing out, no matter how embarrassing or hurtful it was, and is to me. However, the thing that I most agonized over was how my children would react after reading the book. They were unaware of most, if not all that went on during my trip into the abyss. My youngest gave me five stars, the middle one said how he enjoyed knowing a lot of what was happening and said, “Well done Dad.” My oldest said that she was proud of how honest I was about telling all, and commended me on my bravery to do this. However, perhaps the best came from my stepson who said, “This was like a love letter to your family.” Overall, though I still cringe when someone I know is about to read the book, I believe I have done exactly what God has wanted me to do. 2. You truly are a walking miracle. By all accounts, you should not be here right now. What do you say to doubters or people who discount your story? If anyone discounts the truth about this story for reasons they cannot accept what seems impossible, then to them I say what the doctor who removed my breathing device said the day I awoke. “This isn’t possible. No one goes from the sate he was in to where he is now in three hours. Yet here I am. Sometimes Faith is all we have. 3. What compelled you to write Faith in a Box, and for our readers, could you please explain the meaning behind the title? The meaning behind the title is this. I knew there was a God. I believed this from childhood, but my faith in Him was very weak. My family and some medical staff all declared me a miracle. I woke from a coma thirty days later struggling with a medically induced addiction and paralysis. I could not read, write, tell time, nothing. The rehab doctors all agreed, it would take years for me to recover. I needed to blame someone or something. That was going to be God. But my Faith in God was something I did not want to deal with. I could not believe in a loving, good God. Yet my family kept reminding me of their faith. I didn’t want to hurt them. So, I took that faith, took God and put it in a box. I closed that box lid and it was gone. As I have already explained, I did not want to write this book. I felt I had given three testimonies and that was all God wanted from me, wrong. God wants me to tell the world about this miracle. He wants everyone to know he is here with us, and he’s still doing miracles. After putting off the book for more than twenty years, I had forgotten all about it. Then in November 2011 my wife Kim is diagnosed with advanced cervical cancer. The doctors all say they need to act quickly if she is to have a chance. Kim is crying and I’m scared. After the original shock subsides, memories of the loss of Cindy return. The pain of going through another wife dying has me begging God for his help. Praying for an answer of why Kim. With all that pain from those years long ago resurfacing from my fear of losing Kim, it struck me. I need to write this book, I knew immediately that God was going to be there with me. That every word I write He will guide me. So I began to write. I talked with the hospitals and asked for anyone who had anything to do with that time in my life to come forward and write down what they remember. I would sit downstairs while Kim was receiving her chemotherapy, writing. I wrote day and night until the book was finished. In August 2012, Kim was declared cancer free and has remained that way ever since. God did not give Kim cancer, but He did cure her, praise Jesus. In His infinite wisdom, God knew this was coming to Kim. He used it to give me a kick in the pants to start writing. 4. There are themes of forgiveness, survival and renewal resonant throughout the book. What do you hope your readers walk away with after reading Faith in a Box? Very simply, first, I hope they will come away with a truth that God does exist, and he is still in the business of doing miracles. He is in our lives, guiding us. He is there when we laugh and when we cry. If we hurt He comforts, if troubled He stands with us. He will never abandon us, even if we tell him to get lost. His love for us in endless, and there is nothing you can do that will shock him into abandoning you. No sin is too big for Him to forgive, which is why Jesus died on the cross. Second, I hope that anyone who suffers the loss of a loved one will understand they are not alone. There are people out in this world that can, and will help them, and there is a loving, and good God, ready to be with them. To know that one day they will see them again. Third, for anyone suffering through an accident or an illness and find they are in pain, paralysis, or mental disorder, and all they want is to regain a life they once had, there is hope. Through God, all things are possible. 5. Are there any more books in the works? Yes there are. I am near completing my book on Vietnam. The book is based on my life experiences while serving with the First Reconnaissance Battalion, First Marine Division from September 1969 to September 1970. This book began before Faith in a Box and I started writing it because I felt I had forgotten too many things. Friends, places, incidents I needed to remember. When Tour of Duty is finished and published, I hope to start a sequel to Faith in a Box. This book will cover a faith tested beyond what most of us could endure. Yet, this faith only grew to become a faith so big, so beautiful it stands today as a beacon in the sky for our family to follow. An enjoyable interview about a very inspirational story. Well done. Interview was an insight of a still young man with a great story to tell about his journey and how his faith in God has been renewed.